Give feet a break with the Magic Hour™ Exfoliating Double-Layer Foot Mask Socks from STARSKIN. The nourishing foot mask treats skin to gentle exfoliation and deep moisturisation, leaving feet revitalised. 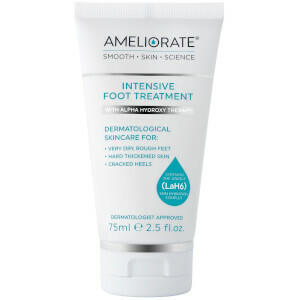 Infused with Lactic Acid, the treatment effectively exfoliates, lifting away dead skin cells and smoothing any rough patches, ideal for cracked heels and callouses. Concentrated with Sage and Soybean, the socks aim to purify, condition and soften the feet whilst a blend of Calendula and Mung Bean boast reparative, and anti-inflammatory properties. The skin is left feeling instantly rejuvenated and supple with the comfort of an at home treatment. Wear on the feet for 60-90 minutes. Use consecutively for 7-10 days. Alcohol, Aqua (Water), Propylene Glycol, Lactic Acid, Isopropyl Alcohol, Urea, Glycolic Acid, Hydroxypropylcellulose, Betaine, Peg-60 Hydrogenated Castor Oil, Chlorphenesin, Menthol, Salicylic Acid, Butylene Glycol, Parfum, Disodium Edta, Algae Extract, Laminaria Japonica Extract, Anthemis Nobilis Flower Extract, Salvia Officinalis (Sage) Extract, Portulaca Oleracea Extract, Malpighia Punicifolia (Acerola) Fruit Extract, Vitis Vinifera (Grape) Fruit Extract, Paeonia Albiflora Root Extract, Sophora Angustifolia Root Extract, Pyrus Malus (Apple) Fruit Extract, Brassica Campestris (Rapeseed) Flower Extract, Calendula Officinalis Flower Extract, Camellia Sinensis Leaf Extract, Glycine Soja (Soybean) Seed Extract, Angelica Gigas Root Extract, Cnidium Officinale Root Extract, Phellinus Linteus Extract, Porphyra Yezoensis Extract, Chlorella Vulgaris Extract, Chrysanthemum Morifolium Flower Extract, Chrysanthemum Indicum Flower Extract, Melissa Officinalis Leaf Extract, Rosmarinus Officinalis (Rosemary) Leaf Extract, Aspalathus Linearis Leaf Extract, Coix Lacryma-Jobi Ma-Yuen Seed Extract, Triticum Vulgare (Wheat) Seed Extract, Oryza Sativa (Leaf) Extract, Phaseolus Radiatus Seed Extract, Zea Mays (Corn) Kernel Extract, Coptis Japonica Root Extract, Ganoderma Lucidum (Mushroom) Stem Extract, Rheum Palmatum Root Extract, Acer Saccharum (Sugar Maple) Extract, Vaccinium Myrtillus Fruit/Leaf Extract, Saccharum Officinarum (Sugar Cane) Extract, Phenoxyethanol. I am a huge fan of this product and have used it many times. Next to what it does I really love the sauna-effect this product creates due to the double-layer socks. Depending on my foot condition, after using this mask my feel start to peel away in the following days, providing me with baby soft feet. I really love this product! This foot mask will fulfill your expectations in that the skin on the bottons of your feet will start to shed in about a week after you've used the mask (it didn't seem to do anything at first but trust me, just wait). My problem with this product, however, is that the skin doesn't shed evenly so you're left with patchy, awkward looking soles. It also leaves a lot of skin residue in your socks, which is messy. I prefer having a real pedicure and pay a bit more. They are simple to use, relaxing and worked a treat !! It may look a little weird, but once you use it, it really works! Had amazing feeling feet afterwards! This product may look a little bizarre when you wrap the bags around your feet but IT REALLY WORKS! After a few days all the dry skin on my feet peeled away and I used a foot file to remove the peeling dead skin. I will use this monthly to keep my tootsies soft and shiny! I always forget about my feet - why not give them a mask as well - once in a while? Amazing product - easy and relaxed, give your feet the treatment they deserve.....!